We are the leading manufacturer of Fly Ash Bricks Chemical Hardener for concrete in India. 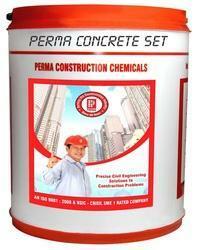 Perma Concrete Set is a used as a Fly Ash Bricks Chemical Hardener & Cement Concrete Hardener which is chloride based accelerating admixture for use in non reinforced concrete and mortars. When admixed with concrete and mortar along with water Perma Concrete Set accelerates the setting time of the concrete and mortar and helps in achieving high early strength. This product is of use in shot-creting and guniting and in concreting and rendering in cold climatic conditions. Paver industry can highly benefit from the use of this product as it helps in early de-moulding and early shifting of the paver blocks to site saving enormous amount of space utilized in conventional curing and its strength development. We manufacture Concrete Hardner in the brand name of PERMA with good quality in India. It is used in variuous construction application by applicator. Looking for Concrete Hardning Compound ?